Anne Hathaway and Academy president Tom Sherak today have the honor of announcing the nominations for the 2010 Academy Awards at a ceremony in Beverly Hills, California. Fantasy “Avatar” and war movie “The Hurt Locker” claimed nine Oscar nominations each, including best film, pitting the two against one another as front-runners for the world’s highest film honors. This year Best Picture has ten nominees! 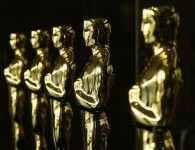 The 2010 Academy Awards will air March 7 at 8/7c on ABC. Steve Martin and Alec Baldwin will serve as co-hosts of the event. This entry was posted in Featured, Interesting and tagged 2010, 20th Century Fox, 82nd, Academy Awards, Annual, Avatar, Century Fox, Harry Potter and the Half-Blood Prince, Hollywood, James Cameron, Oscar, Oscar Nominations, Sherlock Holmes, The Blind Side, The Hangover, Up, Up in the Air. Bookmark the permalink. Thanks for one’s marvelous posting! I certainly enjoyed reading it, you’re a great author. I will always bookmark your blog and will often come back very soon. I want to encourage yourself to continue your great posts, have a nice day!